Thanks to Sam for sending me this lovely video which she took of Lucy at her BE event last weekend - what a clever girl, and doesn't she look fantastic! 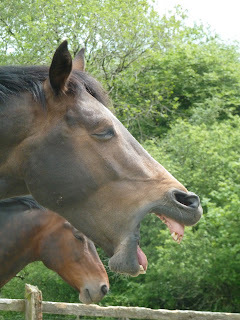 The horses are if anything more enthusiastic to come in now than they were when it was raining! Not a wet morning from Nic Barker on Vimeo. What wouldn't I give now for 4 days of guaranteed dry weather (NO smugness or sniggering from the Texans in the back row, please). Time for a proper George update as I know both his family and his fan club are dying for news :-) As a bit of background, George arrived just over 2 weeks ago and had a raft of issues diagnosed on MRI despite having been barefoot for a long time and having basically strong feet. 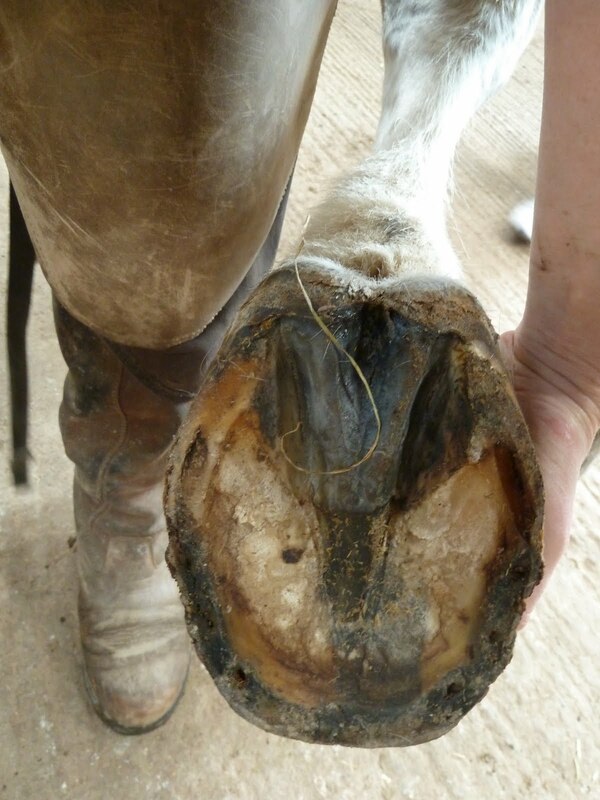 I wrote about him here, because its always salutary to remember that hoof health is about a lot more than shoes or no shoes. So here is an interesting shot of George's feet the day he arrived - the nail holes you can see are because (quite understandably and sensibly) his owners and vet had tried a set of shoes when he first went lame, although they were taken off when they didn't improve him. This is the same foot 2 weeks later - the photos below are also all taken 2 weeks apart. The important thing to notice is that the foot already has better overall balance - he is happy to weight the back third of his foot, which he isn't in the top photo, and as a result his hoof pastern axis is better. George from Nic Barker on Vimeo. 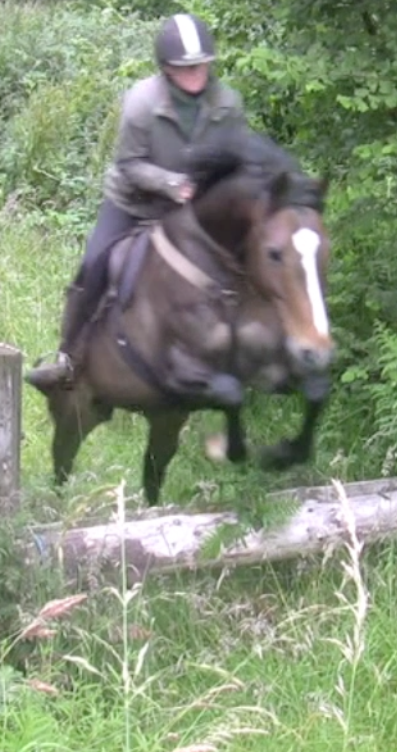 His toe first landing has improved at the same time as his caudal hoof health - its chicken and egg, really. I haven't trimmed his heels, by the way - the long wall has mostly been worn away on the tracks and more importantly his frog has beefed up again. And from his sole shots you can see how 2 weeks has made a difference in frog and sole health - again no trimming required. Its likely that his medio-lateral balance will alter as well over the next few weeks and now that he can begin to work on tougher surfaces he should be able to make lots of changes! "Needless to say she got a 34 dressage...the terrain was testing for no shoes with very steep muddy inclines and declines and she found her way round no trouble"
I've added a new page of frequently asked questions to the top bar. This replaces the rehab horses tab, which was proving too time-consuming to keep up-to-date, and as news on rehab horses can also be found within the main blog, I thought a FAQs page was a better use of space. Pocholo has been here for just under 3 weeks and Annette came to pay him a visit yesterday so it was a good chance to compare how his hooves are doing. He had been out of shoes a month before he arrived but had had a toe first landing for a long time. He is not able to work on harder surfaces yet but has been working in hand and under saddle in the school and of course has also been out on the tracks with the others. His frogs and caudal hoof are improving, as you can see comparing the photos from day one and yesterday. Pocholo from Nic Barker on Vimeo. Pocholo wasn't MRI-ed, but it seems likely from the way his hooves are changing that his medio-lateral balance was also poor, particularly on his LF (which interestingly wasn't his lamest foot). However you can see on the video footage that his LF has not improved as much as his RF. Hooves never cease to surprise me. Now to resume normal service and back to stuff for the hoof anoraks amongst you. As you will have noticed by now, I am convinced that caudal hoof strength is dependent on frog health and frog stimulus, and vice versa. 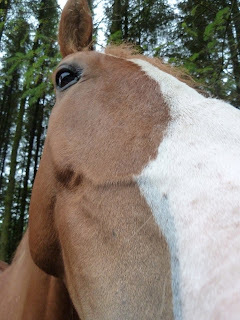 There are several horses here at the moment who are demonstrating this very nicely. Flynn arrived with a nasty central sulcus infection in his RF, which was always going to be stubborn to get rid of. In these photos, 8 weeks apart, you can see how he is now starting to get on top of it finally. 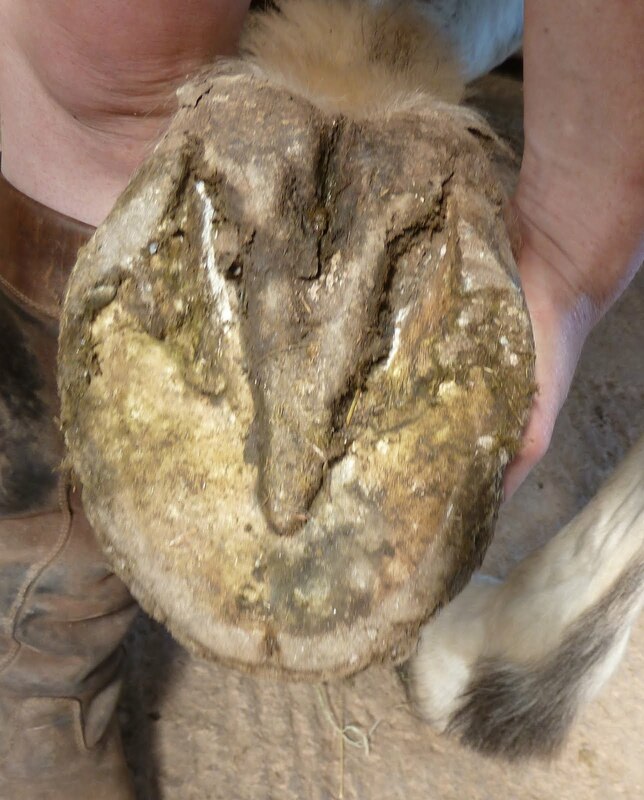 These sorts of central sulcus problems, also called sheared heels, are something to beware of in a shod or barefoot horse. They are often overlooked as being a minor problem but cause enormous discomfort and can even cause a horse to land toe first and lead to DDFT injuries in the longer term. 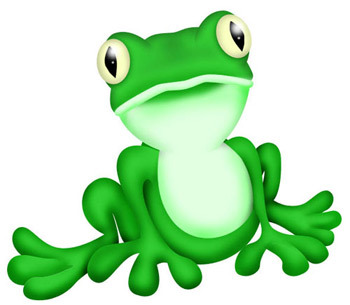 Back to another frog problem, but a much easier one to improve. George, as you know, arrived 2 weeks ago with a weak caudal hoof even though he has basically good feet. The problem was that his frogs were weak and no longer receiving proper stimulus and this in turn and left him with hooves which were landing and loading incorrectly, with heels higher than his frogs and long hoof wall. Two weeks later and you can see that his frog is rapidly becoming stronger and is now allowing the hoof to load caudally again, which in turn is improving his landing and reducing the stress on his tendons and ligaments. Footage to follow, but the message is clear, I hope, that it never pays to overlook your frogs! Its got celery, its got bare hooves, its got dodgy ground conditions, its got xc jumps, its only a minute and a half long - what more do you want?! After a week which started out as a wash-out, here is my attempt to end it on a high - thanks to Andy for the camera-work - he is definitely getting better at it, although it helps that Felix is a "one-take" horse! Most of all, of course, kudos to Felix, the most incredible pony in the world - although I do have to keep apologising to him that it took me so many years to realise a bridle was an unnecessary distraction...he is just AWESOME! I posted yesterday about the surfaces on the tracks here, and how they help horses self-trim, to a certain extent. Several of you have commented in the past that self-trimming is not always practical and I completely agree. For my own horses the tracks aren't enough once they switch to light work and so trimming inevitably comes into the equation. I've also posted before about the harm that the wrong trim can do and how this is all too common. Ironically Solomon, who was one of the horses who prompted that post, had hoof wall which was too long when he came back here, but it was over zealous trimming which had caused his lameness. So if the answer isn't over-trimming, and its not (always) no trimming, where is the middle ground? I've been thinking this over a lot particularly with the horses who've arrived recently. 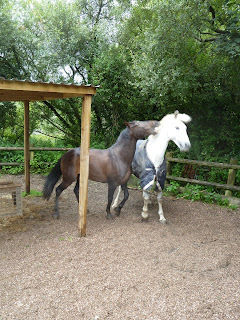 For instance, Flynn and Saffy arrived with overly "long" hooves, as did George and Pocholo. In all these cases, I didn't trim them but let the tracks do their job. In most cases, 24-48 hours walking around on the tracks is all that is needed to get rid of overly long hoof wall and the horses get to do it in their own time and more gradually and gently than if they are trimmed. By the way, with a sound horse, a few hours roadwork would do the job equally efficiently. The tracks and surfaces are important for rehab horses with weak feet but really aren't necessary for a sound barefoot horse in work. So what is the secret (IMO) to a successful trim which will help and not harm the horse? Its not about "rebalancing" the hoof. Its not about creating the "correct" angles. Its not about sculpting a model "wild hoof". Its obvious when you think about it - a good trim simply allows the horse get rid of excess hoof wall that he can't otherwise get rid of on his own. Thats all - thats why a trim is most relevant to horses in lighter work or kept on softer surfaces, and thats why a trim is such a small part of the complex equation that is hoof health. So whats the problem? The problem is that we all too often mistake appearance for substance, and I've been as guilty of this in the past as anyone else. Humans have a tendency to think that if we can make a hoof look like a healthy, functioning hoof it will actually be a healthy, functioning hoof. This is one of the reasons why concepts like a "wild hoof model" or a "high performance hoof model" are appealing but often don't work in practice. Solomon was in a similar position when he came back here in May for a few weeks. In this picture of his hoof the day he arrived, the temptation is to get trimming - sort out the untidy bits, get rid of that wall and lower those long heels. 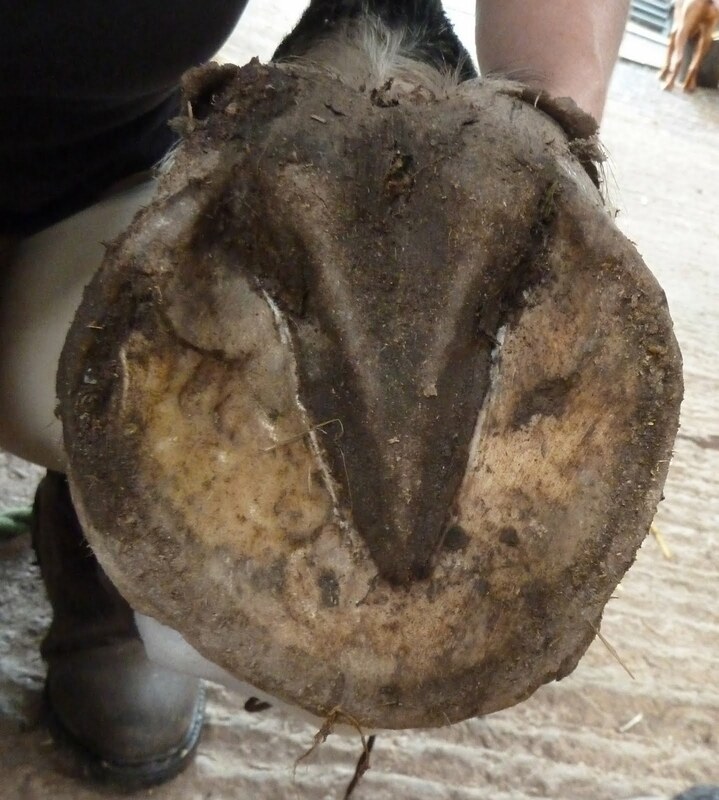 That would certainly make the hoof look a bit more like the functional hoof in the picture below. The problem is that this approach doesn't take account of the fact that hooves can be weak not just because there is too much of one structure but also because there is not enough of another. Trimming can only help the first, because all a trim can ever do is take away. To build a foot up, "celery"* is far more beneficial. For Solomon, you would do no harm lowering his long hoof wall at the quarters (though roadwork or the track would do the job as well) but the back of his foot is a different issue. Its not that his heels are too high, its that his frog is too weak. By lowering his heels you would put more pressure on the frog, but putting pressure on an already weak structure won't necessarily make it stronger - in fact it can overload it and cause a worse problem. So the most fundamental part of a successful trim (IMO) is knowing when to stop. * For those new to the concept of a "celery" trim, the explanation can be found here and here! As some of you know, I've been doing less and less in terms of actual trimming over the last year or so, partly because I have found the horses are doing more themselves and partly because they tend to do it better than a human given half the chance. Of course, not everyone has the sort of environment where horses can self-trim, not least because not everyone can give their horses enough mileage on tough surfaces. There is a huge difference in my own horses feet during the times of the year when they are working hard (August till April). For these months, several are completely self-trimming and the others only need the most minor of tidy-ups but during the summer months some do grow more hoof than can be worn with the more limited mileage they do on the tracks and hacking out. By contrast the rehab horses are normally self-trimming while they are here even though they don't do such high mileage. Why? 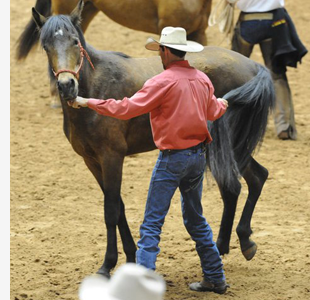 Because most are in shoes and/or in only very light work or kept on soft surfaces when they arrive here, so the change to the tracks and a more regular work schedule, when combined with a slower hoof growth rate is perfect for self-trimming. Many will need light or occasional trims when they are back home and have grown in a new hoof capsule because by that stage their hoof growth rates have increased but for others their work load and growth rate may match and they may become self-trimming and need no human intervention with a rasp. 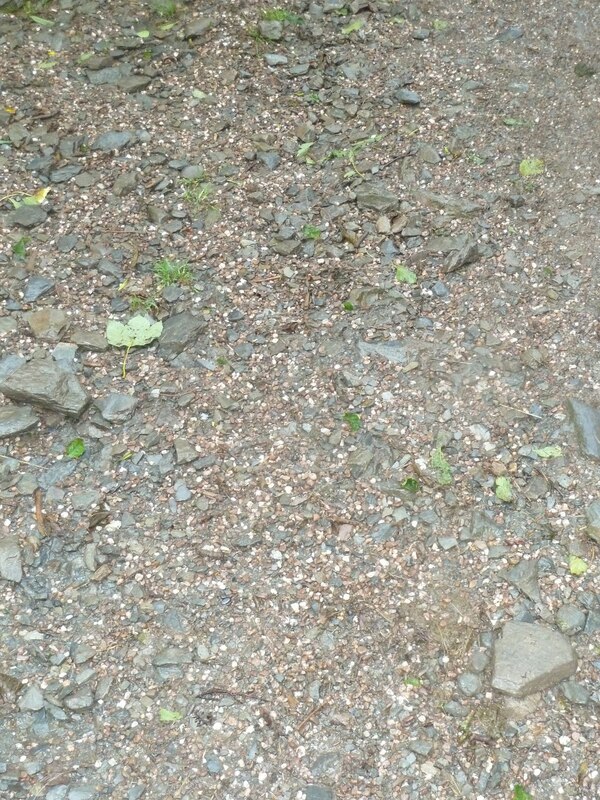 Of the surfaces we have on our tracks, this is probably the most useful one for rehab horses. 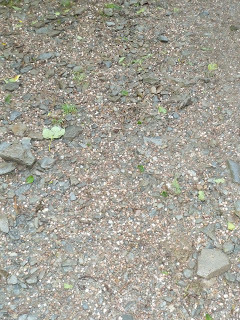 Its 5-10mm shingle which doesn't pack down and its is of varying depths - 2-6 inches generally. We have a yard and a long section of track which are covered with this and generally even rehabs with dire feet find this comfortable. 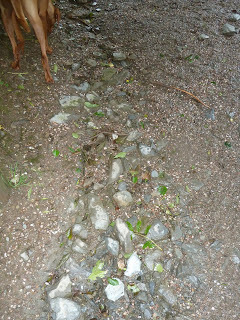 Because it doesn't pack down it can get moved either by horses mooching around or by heavy rainfall and is best laid in fairly flat areas otherwise you get left with rock or whatever is underneath it - as in the photo below. 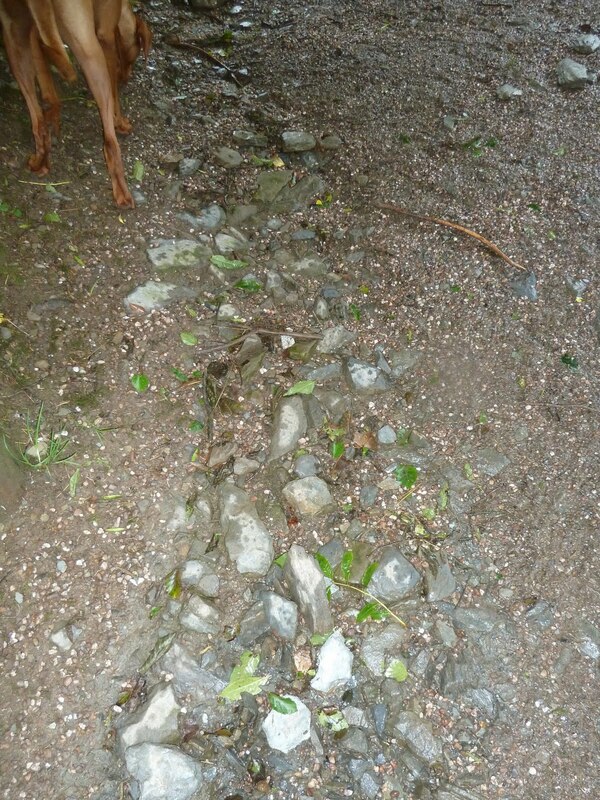 Generally, our track has rock or shillet (below) as the bottom layer which drains well and is great for horses once they have the beginnings of good hooves. Its a much tougher surface and rehab horses don't normally choose to walk on this initially. Its important that they don't have to, either, and next to these areas are softer tracks which they can use if they prefer. 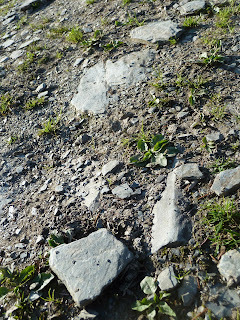 We have a yard of this which is being pea-gravelled next month, which I think will improve it for the rehabs. There is an area of conifers in the middle of the track which can get very wet, but again there is a well-drained track through the middle and round the bottom of it, onto another pea gravel track, so horses don't need to go through wet areas if they don't choose to. 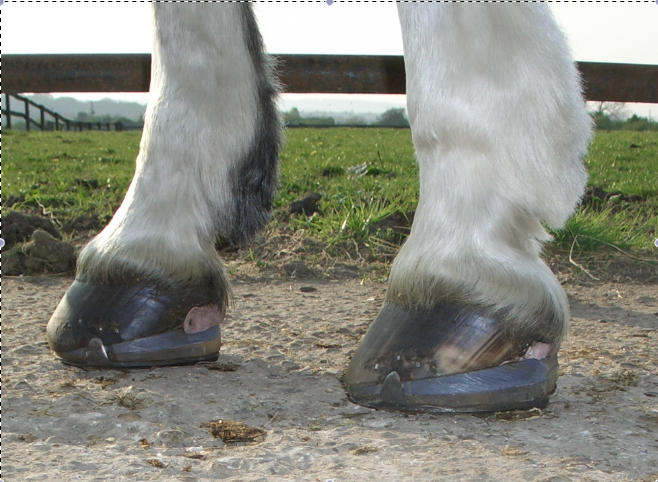 This is probably the least useful area in terms of hoof wear, because its generally softer, but it does provide protection from flies in hot weather and gales in the winter! So I wanted to get some footage for Matt (who owns Flynn), who is in New York being a wasp (yes, really and its not even an acronym, have a look at the link! ), Sarah (who owns Zan) who is having a tough week in London and Jacqui and Maddy (who own George) who are in Spain. Its not just Harvey who went home last week to work his little socks off; Kate has emailed me to say that Saffy has been working hard too - a combination of schoolwork and hacking out. She arrived home on Monday night and worked each of the next 4 days - fabulous! As with most rehab horses, both Saffy and Harvey have a way to go before they have fully grown in a new hoof but its fantastic when owners are able to crack on and keep the work levels up. Saffy had been finding work, especially schooling, very difficult in the past and Kate had understandably and quite rightly been unwilling to force her through what was clearly a pain issue. "Over all I am very pleased with her attitude towards being ridden. Now that I don't have to fight with her to get her to move I can concentrate on slowly building her fitness up and her balance on a left circle. She is clearly enjoying her work again which I knew she wasn't when I sent her to you"
Another pair of owners I was very pleased to hear from was Michelle and Tiffany, who own Dilly and Oscar. They both went home in May and though Oscar has been working well, Dilly in particular has struggled with grass and mineral levels. Michelle and Tiffany have spent time, money and energy analysing and balancing the grazing and forage at their yard and this hard work and dedication is now really paying off. 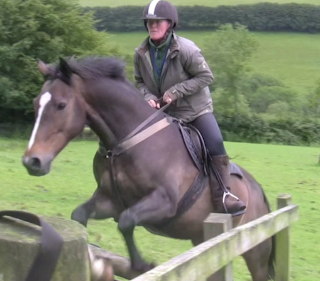 "Lucy went cross country schooling for the 2nd time yesterday and she was FAB. I knew she was good, but she is better than good. We did lots of Pre Novice combinations and she just took it all in. You will also be pleased to know although the first session she was reluctant at water, she went straight in yesterday. Both times she jumped in too and LOVES it." A nice postscript to my post about Dillon on Friday as well, as when I sent the link to his vet she not only went the same day to go and look at it but also was pleased to see how much he had improved - excellent news and its lovely to deal with a vet who takes such an ongoing interest in her patients. Back at Rockley, I am putting together a post on surfaces - with pics - for those of you who were asking about those a while ago and I should get that up here tomorrow, all being well, unless something REALLY exciting happens in the meantime! Harvey back home from Nic Barker on Vimeo. As you can see from Harvey's feet the day he went home, he has - like most rehab horses - still got about half a new hoof capsule to grow and he should continue to improve as he does so. 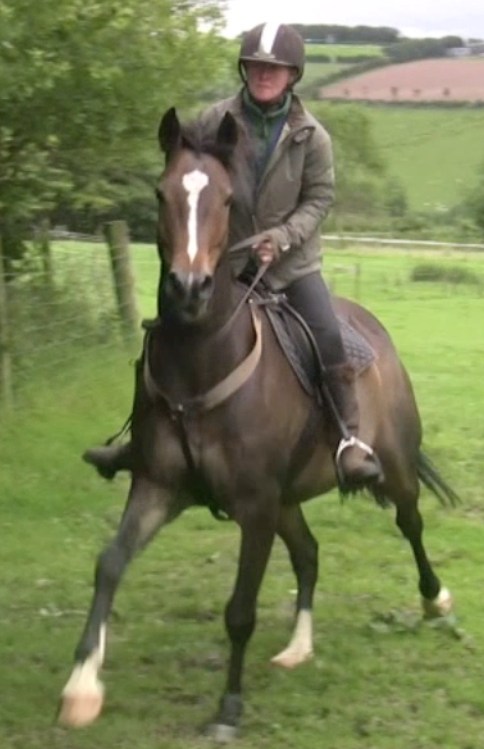 Miles and miles out hacking, as Kate is doing, is a brilliant way to ensure this! Nicky has sent me some earlier photos of Dillon which give a really interesting insight into his wedges and the progress of his hooves. This is him in March, with his first set of wedges, which improved his lameness. By April he was in a double set of wedges, which long term I suspect would have caused all sorts of back problems, given the effect its having on his stance. As it happened, they didn't stay on long anyway as Dillon not surprisingly pulled them off. By June he was in these wedges - a sort of halfway house between the single and double wedges but which again weren't a long term solution. For comparison here is the same foot about a week after his shoes came off (above) and today (below). Not an enormous change, but more structure to the caudal hoof and a better stance. A sole shot of the LF shows how that stronger caudal hoof is developing - from day one above to today - still a weak foot but improved frog structure and the start of a healthier hoof. Dillon was unusual as he arrived with a heel first landing, but as you can see from his footage, it was a rather unnatural and exaggerated movement in front and his hinds legs were landing flat/toe first and sliding. Dillon from Nic Barker on Vimeo. 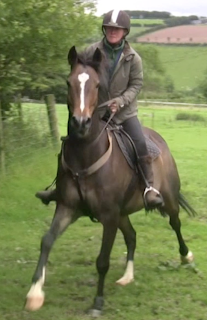 Four weeks later his movement is better - heel first on all four feet and still with a good stride length. BTW, for all those who doubt the St Swithin's Day saying, even a meteorologist admits that, although it can't be taken literally, "the perpetrators of the sayings surrounding St. Swithin's Day during the Middle Ages were obviously aware that summer weather patterns are usually quite well established by mid July and will then tend to persist until late August, a fact backed up by the fact that similar sayings exist around the same time of year in Belgium, the Netherlands, Germany and France." ...or is there more and more publicity and hype for events which personally I find particularly distasteful - you know, the ones where a load of big blokes in cowboy hats (funny how none of them ever wears a proper hat) compete to see who can sit on young horses with no topline the fastest. I've started to see them all over Facebook - currently there is one in the US and one in Australia and call me old-fashioned but they don't impress me in the slightest. Can you imagine if you dropped off a toddler at kindergarten and were told by some big, burly bloke that you could pick the kid up at the end of the day because he would have been taught some basic manners by then? Any normal parent would run a mile. And can you even begin to imagine the furore if a couple of rival kindergartens said they would each take a toddler for a day and see who could teach the most? 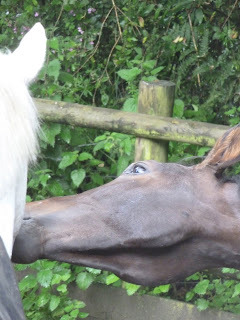 Never mind the so-called training - the fact is that these are young horses - unhandled, unschooled, untrained and undeveloped for ridden work, whose joints aren't going to benefit from a tiny, cramped, confined space where there is no possibility of them moving in a straight line. So what are the arguments in favour of these events? That they are educational for spectators? The problem is that there is little explanation of what the burly blokes in hats are doing and things happen too fast for people to safely learn from or replicate at home (hmmm, perhaps thats a good thing...). Is it just a good way of selling tickets - like trying to fill the 02 but without Take That (personally I'd prefer Take That any day)? I've got a barefoot angel! 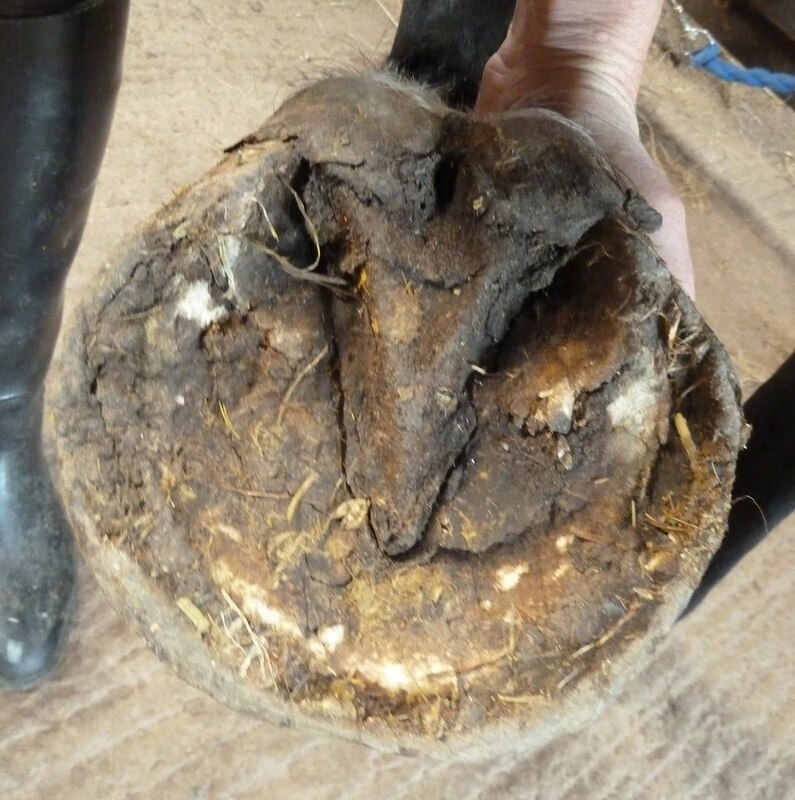 When is a hoof problem not a hoof problem?